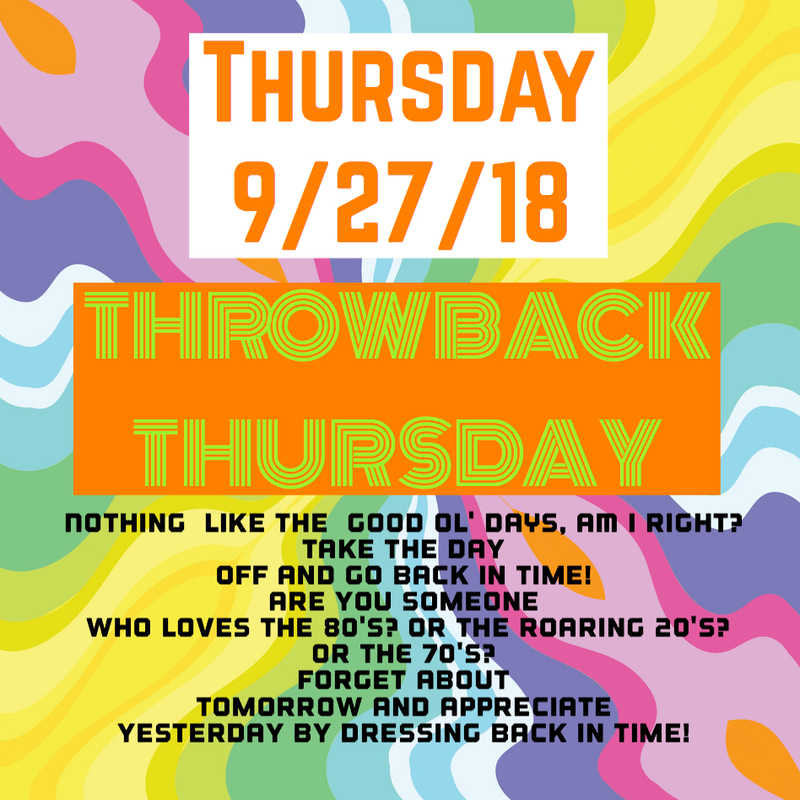 Get ready for Spirit Week Sept. 24 - 28! 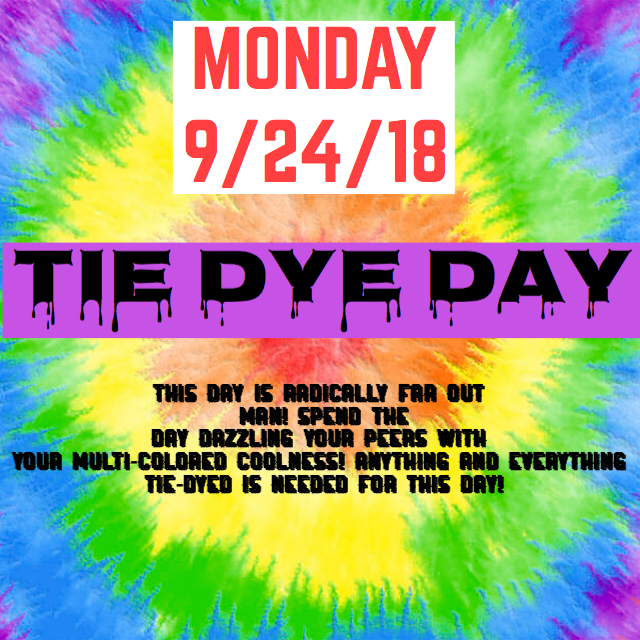 Monday is Tie Dye Day!! This day is radically far out man! 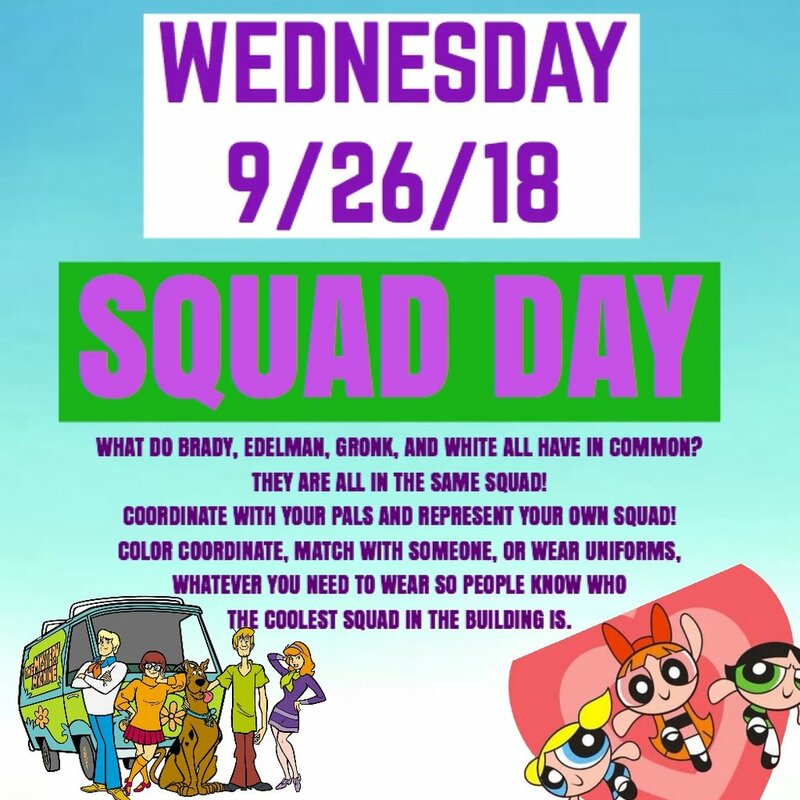 Spend the day dazzling your peers with your multi-colored coolness! Anything and everything tie-dyed is needed for this day packed with swirls of rainbow colored wonder. ­­You aren’t from around here are you..? Is there anything more out of place than a tacky tourist? 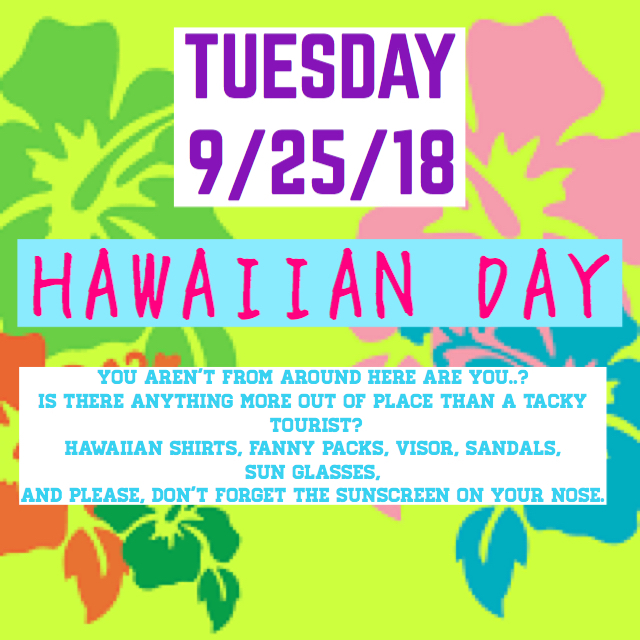 Hawaiian shirts, fanny packs, visor hats, glasses with flip-up sunglasses, socks and sandals, and, please, don’t forget to sunscreen your nose. What do Brady, Edelman, Gronk, and White all have in common? They are all in the same Squad! Coordinate with your pals and represent your own Squad (group of friends). Color coordinate, uniforms, whatever you need to wear so people know who the coolest squad in the building is. Nothing like the good ‘ol days, am I right? Take the day off and go back in time! Are you someone who loves the 80’s (who doesn’t)? Have you always wanted to dress like a disco queen? What about the roaring 20’s? Or, perhaps you just want to ‘throw it all back’ to when you were living your ‘best life’. Forget about tomorrow and appreciate yesterday by dressing back in time. For the Pep Rally, represent the grade you are in! 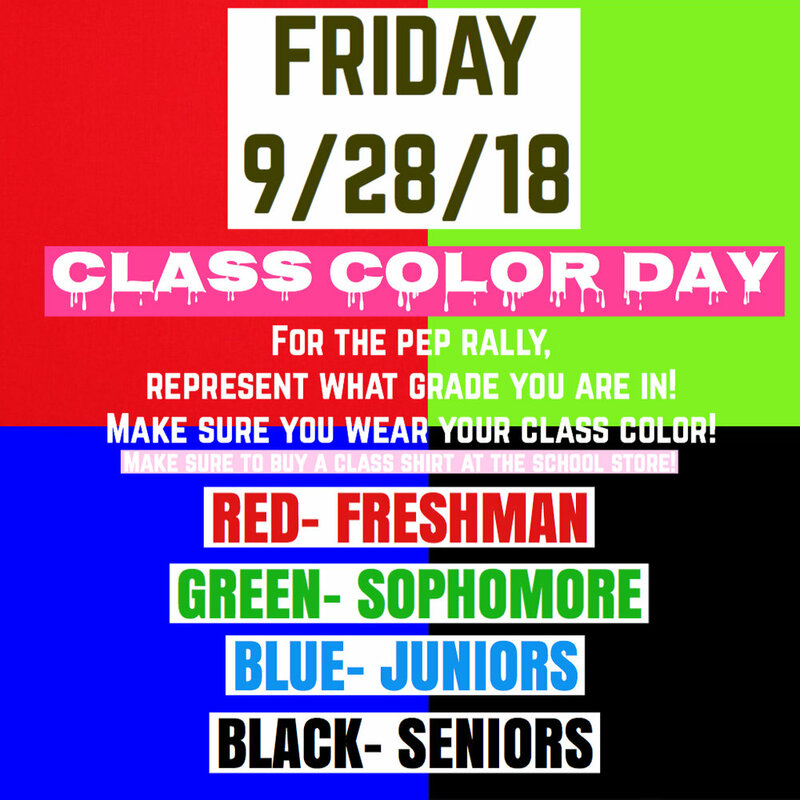 Make sure you wear your class color, Red for Freshman, Green for Sophomores, Blue for Juniors, and Black for Seniors. Make sure to buy a class shirt from the School Store. Wear your Tie Dye on Monday for Spirit Week kickoff! Save the date! Open House is Sunday, Nov. 4th, 1 to 4 p.m.